Explaining all of the benefits content marketing can provide an online marketing campaign can be a daunting task for one blog post. However, this analogy is a good start at truly spelling out why content marketing is so important for inbound marketing, search engine optimization (SEO), and social media marketing. If you were a child would you rather play in the bathtub below with only a few inflatable balls. 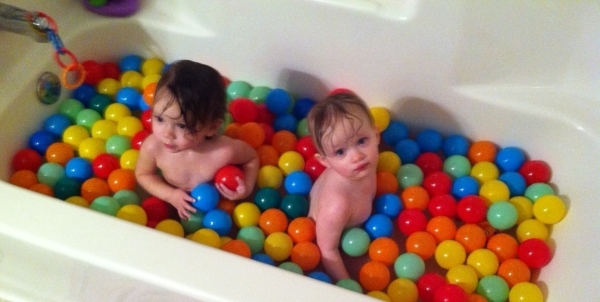 . .
Or would you rather play in this bathtub with a whole bunch of inflatable balls? If you’re not sure what the answer is you can trust my 20 month old twin daughters – they love it! How does content marketing fit in this analogy? Imagine the bathtubs above as websites, the inflatable balls as web pages with content, and the children as adults surfing the web. When people are looking for answers to their questions or to be entertained they want to have access to the best, most valuable and timely content they can in order to help them solve their problems. The more of this type of content is available the better the experience is for the web surfer. Parents know which bathtub their children would prefer just like Google knows which websites their users would prefer. Their whole Panda/Farmer update is centered on the idea of rewarding valuable unique content. The more content a website has the more opportunities it has to rank for the keywords on those content pages. The more frequently content is published on a website the more often Google has to come back to the website in order to index the new content. As more and more content is published more people will naturally be exposed to the website’s brand which typically results in a significant increase in branded searches. This is substantiated by dozens of clients’ analytics. Additionally, Google’s webmaster guidance communicates that little or no original content is a detriment to a website’s ability to rank well. After looking at SEOmoz’s 2011 Search Engine Ranking Factors Report, a full 82% of the SEO factors mentioned would be positively impacted by content marketing. The more content a business has to distribute across social media channels the more potential conversations can take place. When new content is produced frequently and pushed out to friends, followers and fans the number of sharing opportunities increase. With social media playing a bigger role in SEO, content marketing with social media distribution will help support a website’s search engine optimization campaign. Having lots of good content to talk about, share and build a community around is critical to a successful social media marketing campaign. For hard data and numbers which validate the above please see How Much Does it Cost a Company to Stop Blogging - ROI Revealed. This is a small case study which shows two companies that use blogs for their content marketing campaign. The effects of content marketing on their business is clear. For help turning a blog into a content marketing machine download the Blog Post Optimization Cheat Sheet.